Years ago Mom asked my sisters and I to make the desserts for Thanksgiving and Christmas; she and Dad supplied the main meal. 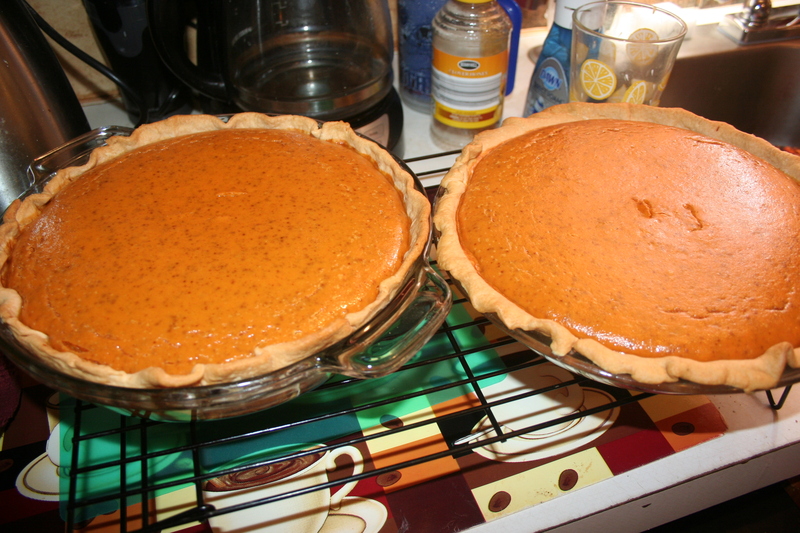 Of course, everyone wanted pumpkin pie, so I took on the challenge. At the time, I did not use the internet for things like this. I asked Mom how to make it and she told me she just used the recipe on the Libby’s Pumpin Pie can. Of course, she made her own pie crust but I wasn’t going to attempt that then. I bought the can of pumpkin and frozen pie crust and set off to baking. It was a hit and I continue to make the same pie to this day, although I have tried other pie crusts throughout the years. This year I used the refrigerated pie crust, like I did for the Apple Crumble Pie I shared last week. 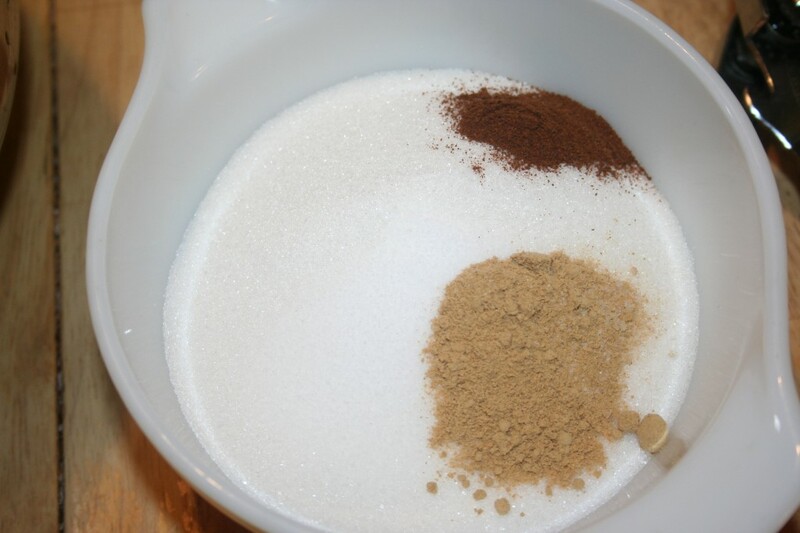 Start by mixing the sugar, salt, cinnamon, ginger, and ground cloves in a small bowl. I don’t know why they say to do that in the directions except that the spices are then completely mixed and won’t accidentally end up all in one spot. 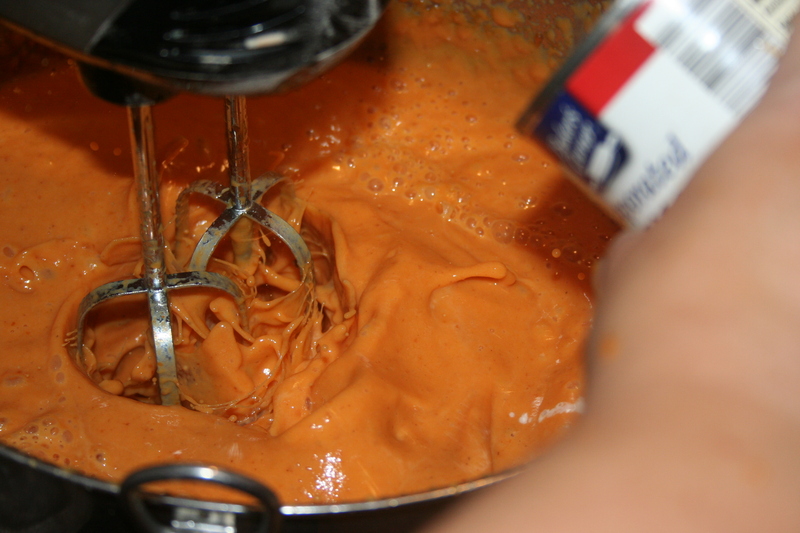 Now add the pumpkin and dry ingredients and combine. 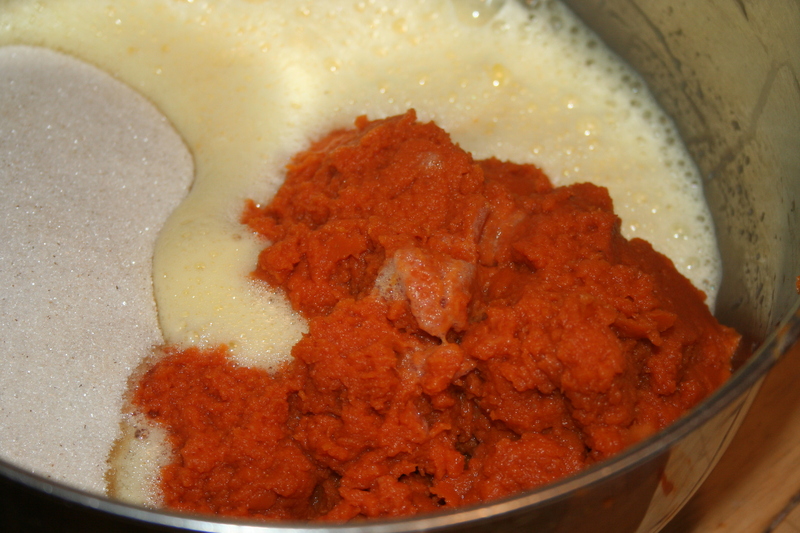 Gradually add in the evaporated milk as you mix. This is a new mixer for me. Although the switch says it has about 4 or 5 speeds it really only has two – high and HIGHER. I was making a double batch so the bowl was rather full and kept spitting everywhere. I have the evidence on my recipe in my recipe book, which is in need of replacing yet again, but that is a story for another time. 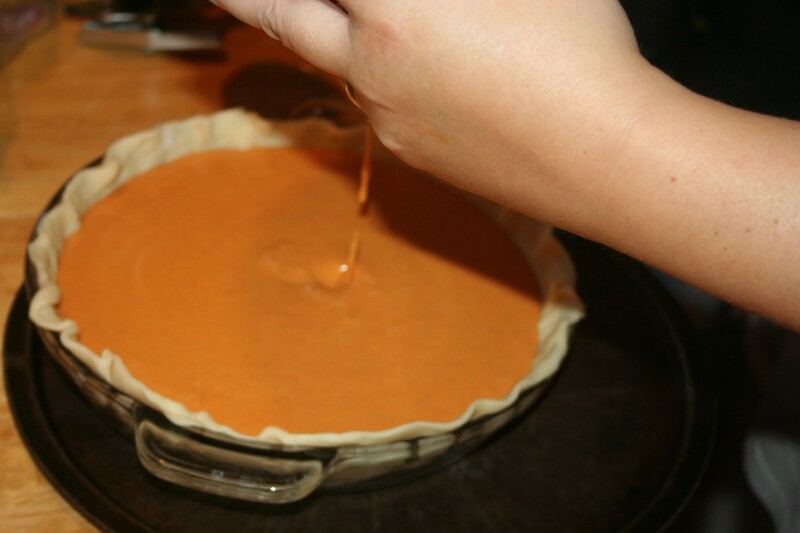 Pour in pie shell. I place my pie pans on pizza pans to catch any spill-over. Bake in a preheated 425º oven for 15 minutes and then reduce the temperature to 350º and continue baking for 40-50 minutes or until sticking a butter knife point first into the center and removing, comes out clean. Cool on a wire rack for 2 hours. Best served cold with whipped cream. Mix sugar, salt, cinnamon, ground ginger, and ground cinnamon in a small bowl. Add pumpkin and dry ingredients from small bowl. 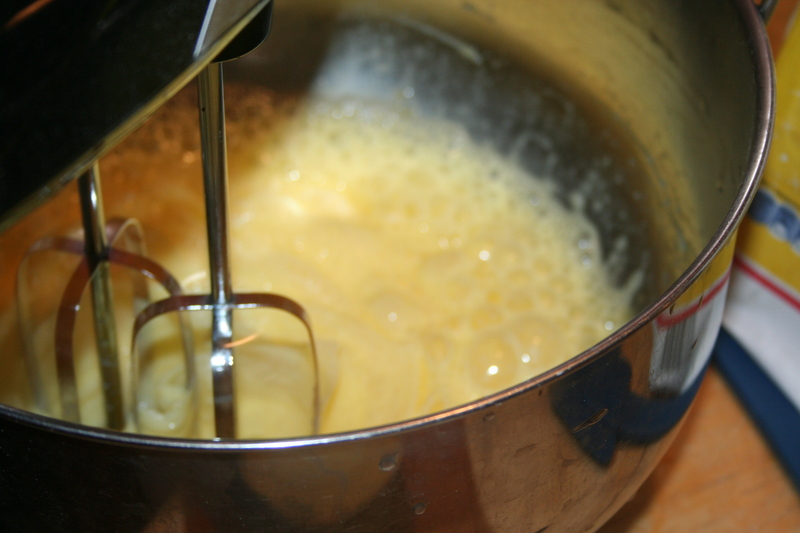 Gradually add in the evaporated milk. Bake in preheated 425º oven for 15 minutes. 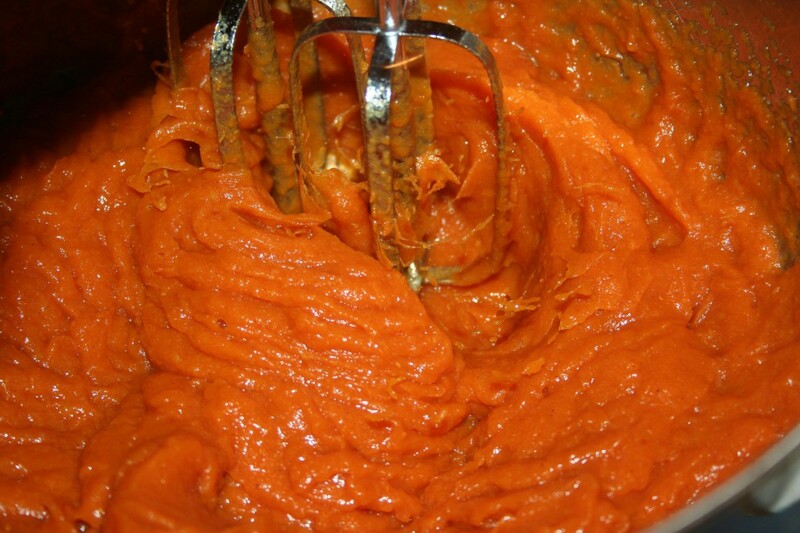 Reduce heat to 350º bake 40-50 minutes or until knife comes out clean. Serve cold with whipped cream on top. P.S. Once again, this recipe is from Thanksgiving and I forgot to take individual serving pictures. I’ll be doing it again in a few weeks and will try to remember to take the pictures then and update. Thanks for bearing with me!